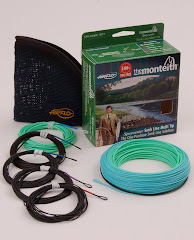 This is the only sunk line multi purpose Spey line available and those who currently have them are more than delighted. The sad thing in our industry that's happened over the last few years is the invasion of the shooting head line and fast actioned Scandinavian styled rods . Although these systems are effective too they are flat out ugly compared to the elegance of a Spey tapered line and through actioned Spey rod. I suppose the next thing the market will dictate is that we give up our malts for schnapps and swap our kilts for lederhosen !!! For more information on this truly Scottish groundbreaking product Click here.